Deleting files by accident can be quite a bummer - one most us are painfully familiar with by now. Especially on those tiny devices, it is easy to confirm deletion of a file you actually just wanted to open, or maybe swap away some important client contacts. Unlike good ol' Windows, or pretty much any OS out there, mobile devices, like Android-based phones, lack a recycle bin feature. So deleted files are gone for good in the vast majority of cases, and not canned somewhere are your convenient restore length. How can you avoid this? Simple, meet Undelete for Root Users, a neat app developed by Fahrbot Mobile. This app can be used on Android devices to restore files quickly, without the need for cloud storage, backups or other software installed on your PC. Note that Undelete for Root users, as the name strongly suggets, requires root access on the Android to function. Be sure to root your phone before you use this app. Here's how you can root a Motorla Droid Xyboard, for example. Search our site for more rooting help. The app supports over a 1,000 file types, so chances are close to 100% that your lost and soon-to-be-resurrected data will be recognized. 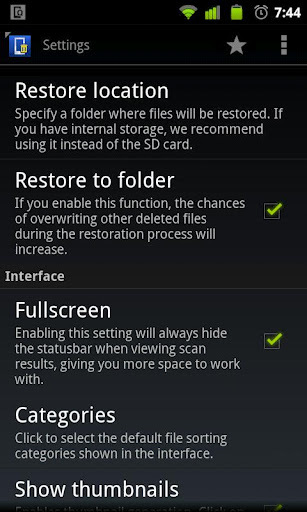 The restore feature is intuitive to use, a feature Android fans are sure to appreciate. It sorts files by type, so you can search for music, photos or other data restoring. You can preview media cards before commencing restore, so as to not lose time restoring files you do not actually need anymore. As for the other side of the coin, the Undelete for Root uses app also offers Android users the option to securely delete files, shred files. These can not be recovered by any recovery app or software, so use the feature wisely. Head on to the Fahrbot Mobile webpage and see about trying out the app. If you like it, do not hesitate to purchase a license as it could save you hundreds. Or a lot of headache, in case that is still worth something compared to benjamins, nowadays. If you have synced the data before, you can recover from the backup file. If not, I think you should not add more data to your device anymore. Then, it is better for you to try some professional recovery methods, MobiKin Android Recovery is a good tool for data recovery. Here is a risk-free yet professional tool that can help Andorid users get back their lost contacts, SMS and other files from all models of the Android phone completely. Usually deleted data can still be recovered with help of data recovery software, I may recommend you one I have used before: Android Data Recovery . It is designed for recovering deleted data by mistake.